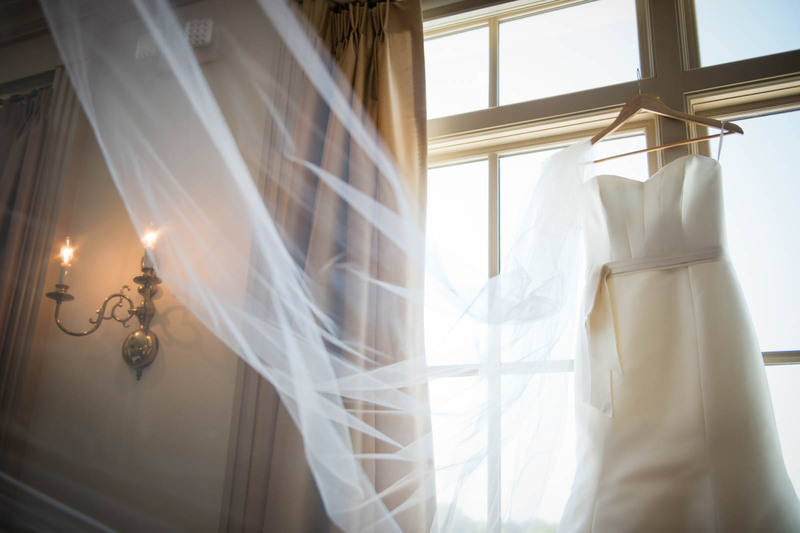 The wedding dress hangs elegantly on the windowsill of the window of the venue, the Charleston Country Club, as the veil gracefully cascades down. The Charleston Country Club is located on the intercostal water way in Charleston South Carolina.The reception area is right under a beautiful live oak tree that just captures the low country feel of Charleston. This was a fun wedding to go to because it was away from our home base in Greenville South Carolina. I arrived at the brides getting ready room and her dress was elegantly placed in the room where it was the center of attention. I took the dress and went to the big window in the room and placed the hander on the windowsill. I took some pictures of it hanging there which turned out great but I thought to add some drama, I pulled the veil out and hang it with the dress. I then pulled the end of the veil so it flowed downward and took the picture off center and a little diagonally to give even more drama and give a since of power to the dress being higher up than the camera.